we could design and synthesize interphases for electrochemical energy storage systems with persistent activity, selectivity, and stability. At the heart of all batteries are interfaces where the actual charge and discharge reactions occur. The interfaces in today’s batteries control not only the rate of charge but also lifetime, operating voltage, and safety. Understanding and controlling the interface is a crucial need for high-energy, long-life batteries. Interfaces, by their very nature, are dynamic and respond to myriad conditions in the battery that change with time from the initial charge-discharge cycle to the end of the battery’s life. 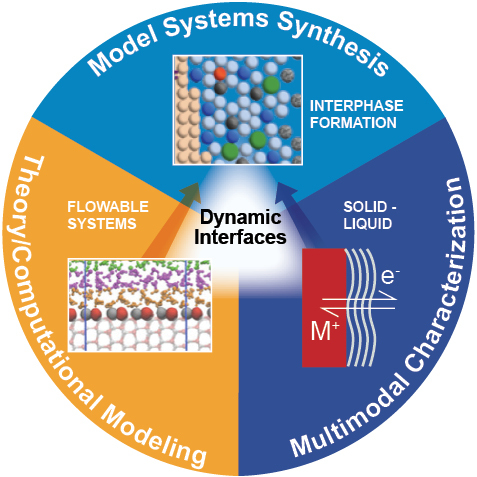 The Charge Transfer at Dynamic Interfaces Thrust combines computer simulation and in situ characterization of evolving interfacial structures to predict and synthesize new interfaces with targeted electrochemical properties such as electrode protection, selective ionic conductivity, and high stability. Its two focus areas are understanding the evolution of spontaneous interfaces from the composition of the adjoining electrodes and electrolytes, and the directed growth of interfaces to achieve specific performance criteria. The Thrust takes reaction chemistry to a new level–predicting and characterizing the outcome of not only a single reaction, but also of a sequential cascade of reactions where the products of the last reaction become the reactants for the next reaction. Understanding and controlling the interface is a crucial need for high-energy, long-life batteries.